Natural remedies for under eye circles became a hot topic following widespread disappointment in high-end commercial products and growing awareness that common cosmetic ingredients accelerate skin aging. While there are numerous physician rendered services that can help, the repertoire of effective natural remedies for dark circles discussed in the medical literature is virtually nonexistent (Roh, Chung 2009). Does the thought been there, done that” come to mind? But hang in there because we’ve got great news for you. We dug deep into the scientific literature and found something . . .
A natural remedy that works! After assimilating data from hundreds of laboratory and human studies, we discovered some truly remarkable properties of an active you’re already very familiar with: vitamin C. Not only is this active a natural remedy for under eye circles, but also a demonstrably potent anti-aging ingredient that will benefit every aspect of your skin’s health from dark shadows to structural integrity. However the key to success in using vitamin C is to apply it in its pure, natural form without the addition of preservatives and other chemicals that both dilute its potency and in some instances, can transform it into a probable carcinogenic. The form you want to use is available as a crystalline powder named ascorbic acid. Tired of hiding dark circles behind sunglasses and unruly hair styles? Ascorbic acid is a proven natural remedy and works by building collagen to thicken under eye skin and mask underlying microcirculation. 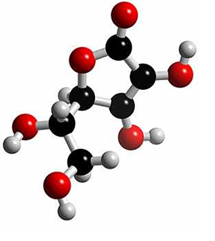 What’s so special about ascorbic acid? In a nutshell, the depletion of skin levels of ascorbic acid underlies every skin aging symptom from wrinkles to age spots (Farris 2005). The problem is so severe over time that skin levels drop up to 425% between youth and middle-age, and the only way to increase ascorbic acid concentrations is to apply the vitamin topically (Shindo 1994, Levine 2001). What about ascorbic acid and under eye circles? The pathogenesis of dark under eye circles is not well understood and cosmetics manufacturers tend to blame the build-up of blood pools under the eyes as the culprit. They then sell formulas aimed at increasing blood circulation (Mitshishi 2004, Eiberlin 2009). However reports from plastic surgeons’ offices assert another cause entirely. Following up observations that the under eye skin of patients with dark circles is thin, these surgeons inject fat to thicken skin and successfully mask the blood vessels (Roh 2009, Epstein 2010). Researchers reporting in Skin Research & Technology inadvertently verified thinning skin as responsible. They were intrigued by numerous studies showing skin rejuvenation benefits from topical application of ascorbic acid and wondered if it would help remedy under eye circles. The researchers formulated two versions of a 10% vitamin C emulsion. One version contained an ascorbic acid compound named sodium ascorbate and the second a compound named ascorbyl glucoside. Sodium ascorbate is ascorbic acid bound to salt and ascorbyl glucoside is ascorbic acid bound to sugar. Ascorbic acid in its natural state degrades rapidly in commercial formulations so manufacturers substitute a variety of compounds marketed as “vitamin C” to enhance stability. Ascorbyl glucoside and sodium ascorbate are among those compounds. However for a vitamin C compound to be effective, it must break down in the skin to release free ascorbic acid (Humbert 2003). In addition, some of the compounds are proven to accelerate skin aging, so it’s important to understand the risks you may run before you apply an ascorbic acid derivative (Meeves 2002). The researchers reporting in Skin Research & Technology enrolled 14 subjects with clinically diagnosed DCLE (Dark Circles of the Lower Eyelid) and told them to apply one of the vitamin C emulsions in the morning and evening for six months. After six months, the researchers evaluated the results. The lucky participants using the sodium ascorbate had significantly reduced under eye circles while those using the ascorbyl glucoside emulsion showed no improvement. The researchers used sophisticated measuring instruments in an attempt to explain the difference in results. They discovered the effective emulsion penetrated to the lower level of the skin (dermis). The dermis is where collagen synthesis takes place and the salt bound ascorbic acid reached the dermis to stimulate collagen formation whereas the sugar bound version did not. The increase in collagen production thickened the skin to mask the microcirculation of blood and alleviated the appearance of dark under eye circles (Oshima 2009). The net effect was the same as that achieved by the surgeons who injected fat into their patients’ lower eyelids. The study just cited is one of many showing that ascorbic acid builds collagen and in so doing, not only thickens skin but also reduces wrinkles and restores suppleness. You can read about ascorbic acid’s collagen building capabilities in our post How to Increase Skin Collagen. However from the standpoint of under eye circles, the most significant finding was that the salt bound version of ascorbic acid penetrated to the dermis whereas as the sugar bound version did not. Sodium ascorbate (salt bound) quickly degrades to release free ascorbic acid explaining its success in penetrating to the dermis (Sakagami 1996). The bonds adhering ascorbic acid to salt are weak, so they break apart quickly. In addition to demonstrating that thickening under eye skin reduces dark circles, the study also showed that weak bonds in a compound enhance the chances that ascorbic acid will penetrate to the dermis. A separate study provided insight to another aspect of ascorbic acid penetration: it increases as a function of acidity. Acidity is measured by pH level, and researchers reported that the more acidic the pH, the better ascorbic acid penetrates (Pinnell 2001). Still another study demonstrated that when ascorbic acid makes contact with cells that make collagen, that it speeds up their productivity by a factor of eight (Murad 1981). Applying principles we learned from these and dozens of additional studies, we hypothesized that pure ascorbic acid applied at a carefully calibrated pH level will thicken skin under the eyes and mask the underlying microcirculation. We were right! Not only did the increase in collagen mask under eye circles in our test subject, but also reduced crepiness and fine lines. Turns out pure ascorbic acid is a natural remedy for crow’s feet also! And the news gets better – under eye circles almost disappeared after only two months whereas it took six months for users of sodium ascorbate to show improvement. Can I use natural ascorbic acid to remedy my under eye circles? Yes, and it’s easy! But first join our Vitamin C & Skin Care Group. The concept of using pure actives to treat skin aging is unique to Dr. Hilton Becker who envisions our web community as the platform for introducing his protocol of 100% natural skin care to the world. In our Forum, you’ll find a supportive environment where we not only teach, but also learn! Every person’s skin is unique and our members share their experiences using pure actives to help improve outcomes for everyone. Moderated by Dr. Becker’s research director, Felecia Rose, you’ll get the personal attention your skin requires. Click here to enter.